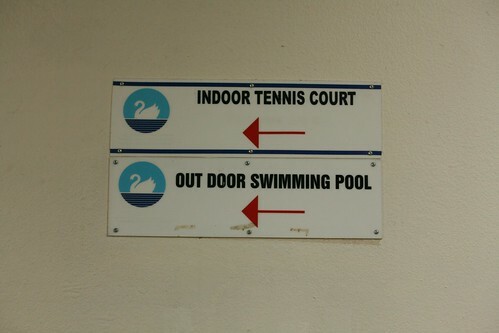 Despite that these signs look somewhat similar, it is likely they were installed at different times. The logos may be the same, and the arrows may be the same, but one includes a black border, the other does not, and the fonts are slightly different. I also find it a little unusual that they needed 6 screws to join this to the wall. I'd imagine an adhesive would have worked fine and caused less damage to the wall in the event that the hallway was renovated.